$10,000: Buys a two month supply of pads and tampons for 40 local schools, allowing hundreds of girls to receive an uninterrupted education. $7,500: Provides 375 victims of domestic violence a new bra for their new start in life. $5,000: Purchases underwear & camisoles for 1,000 of our youngest clients experiencing homelessness. $1,500: Sponsors a school/community center dispenser and a twelve-month supply of individually wrapped pads and tampons so that all can have access wherever and whenever they need it. $500: Purchases new sports bras for pre-teen and teenage girls in Northern Virginia, enabling 25 poor school-age children the opportunity to participate in PE and after-school athletics. $250: Buys 25 boxes of pads or tampons for a PTA sponsored school pantry, allowing students and families to access menstrual products discreetly. $100: Empowers 50 women in crisis by giving them access to new underwear. $50: Purchases a months worth of menstrual supplies, providing basic dignity to five women experiencing homelessness. Don't see an amount that works for you? No problem! Click on the "Donate" button below and type in ANY number! Thank you!!! Click on the "Donate" button above to make a tax-deductible donation and help women and girls in shelters today! ​If you prefer to send a check, our mailing address is: BRAWS, 112 Courthouse Road, SW, Vienna, VA 22180. 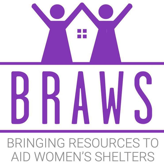 BRAWS is a registered 501c3 and all donations given are tax-deductible Federal Tax Id: 47-3961191. Whatever amount you choose, we are GRATEFUL for your SUPPORT! THANK YOU! If you would like to buy items online to contribute, please visit our Amazon Wish List HERE! *Unopened boxes of tampons, pads, and pantyliners for all ages and sizes. Questions? Please email us at info@BRAWS.org for further info. Click HERE to find a collection site near you!